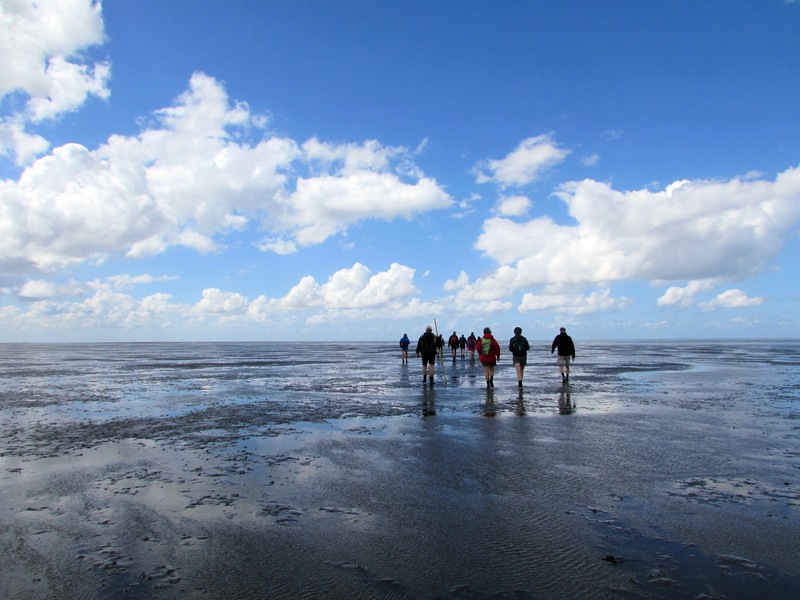 Schiermonnikoog XXL is with its 18 km on the Wad and 4 km on the mainland one of the toughest hiking tours we can offer, only suitable for sporty and experienced mudflat hikers. Between the first and the last of the five tidal creeks that are crossed, a mere 10 km is to be covered which takes 3 hours to hike. A good tide and favourable weather conditions are mandatory. Walking to an island is always special, but due to the huge distance of this tour you really experience the vastness of the Wadden Sea area. With clear vision, the island of Rottumerplaat can be seen on the right, the mainland behind, on the left the occasional ferry and in front of us the salt marshes and dunes of Schiermonnikoog. The tidal creeks as are mud, hard sand and shell banks are evenly distributed over the route. It never becomes monotonous. On arrival, we have an opportunity to rinse and dress up. Taxi or bus will transport us to the only village. A cup of coffee or a nice drink never has tasted so well! At the end of the day, a bus brings us to the ferry which arrives at Lauwersoog fishing port after forty five minutes. Tours by appointment for at least 6 participants: date and time after consultation at aanvraag@vrijewadlopers.nl.